Long ago, there was a King fair and just. But without an heir, and his time running short, the King knew a successor brave and bold would be needed – and soon! In his great wisdom, the King devised a contest to scout the land for a Lord or Lady of virtue true. At the foot of Mt. Oblivion, far to the East, the long-extinct Dragon’s treasure lay hoarded. The hero who could claim the Loot would be crowned sole heir to the throne! But claiming it wouldn’t be easy. The journey would be wearisome and riddled by hardship aplenty. And so, the great contest “Loot Quest” commenced! Loot Quest is a family-friendly table-top board game for 2-6 Players, ages 8+. Players use the dice to move around the board, taking on Quests as they go. Quests are small stories, often involving choices for the Player to make. Will they Lose a Turn to gain a bit of extra Gold? Will they be virtuous, moving back spaces to help a commoner in need? It's all up to the Player! But Players must beware...lurking on the board are Monsters who are just waiting for a snack! 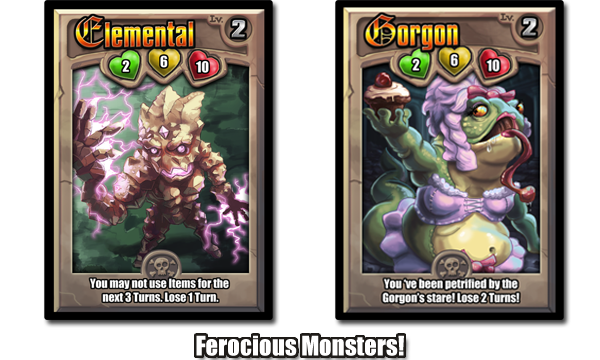 Monster Cards are ferocious beasts which can cause Players to Lose Turns, move back spaces, and many other nasty effects! The closer the Player gets to the goal, the stronger the Monsters become! But Players can fight back! For a bit of Gold, they can purchase Item Cards. Items allow Players to change how the Game plays. 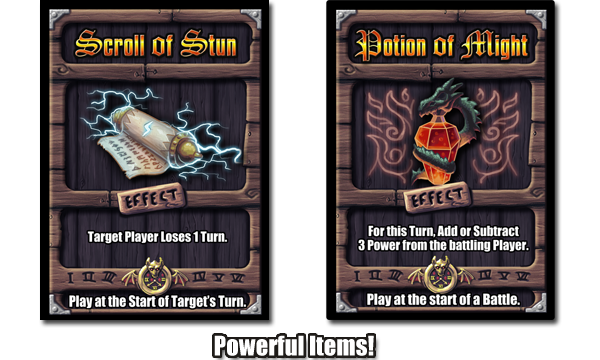 Potion of Might cards can make the Player more Powerful for a Turn, while Flask of Agility allows them to Add to a dice roll. But Items aren't just for helping. The other Players are out for victory, too! 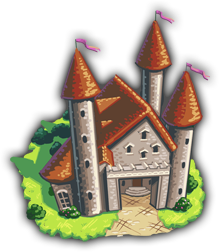 Items can also be used to force other Players to Lose a Turns, or fight a Monster, or to re-roll a dice roll! It's all fair in the great quest for the Dragon's Loot! Go to the Rules Page to learn more about the world of Loot Quest!